It’s not easy to live up to your name, especially if your name is Magnolia. But our bride Magnolia was stunning, as you can see from the photos. The magnolia flower meaning is attached to the symbols of nobility, perseverance, and love of nature. Our Magnolia was all that, and so much more. Magnolia and Billy tied the knot last summer in one of Los Cabos’s beautiful beachfront villas, Villa Marcela. 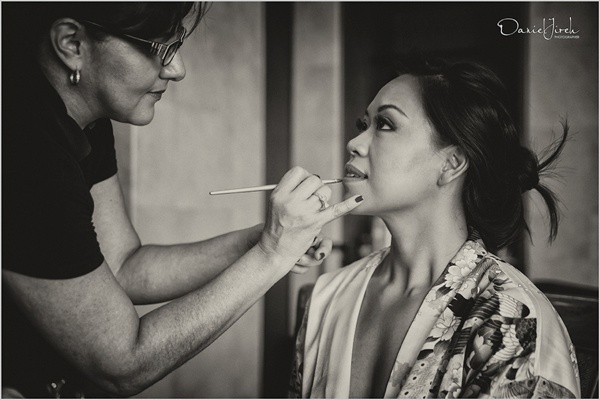 And our Cabo makeup and hair team by Alma Vallejo had the pleasure of being part of their big day. Magnolia and I planned her look thoroughly through phone and email conversation, and when she came to Los Cabos, we did a hair trial. At first, we were considering a side up-do but later changed it to entered up-do with some loose curls. She planned on wearing a veil in the bottom or her hair, and three white orchids on one side, and I think she looked stunning! Magnolia has medium length black hair, and yellow-tan skin tone and beautiful and deep big dark brown eyes. To enhance her beauty and bring out her beautiful features, I used an eyeshadow palette "In the moment" from STILA. I mixed four of those subtle shades all over her eyelid (desire, wonder, spontaneous and whim), and created a light/neutral smoky eye makeup, which looked pretty because it wasn't too bright or too dramatic. We added the eyelashes and so even further enhanced her eye makeup. On her lips, we used plum rose color from Bobbi Brown and on her cheeks a soft pink blush from NARS. Because their wedding was in September, and September is one of the hottest and most humid months in Los Cabos, I used a tridimensional technique for Magnolia’s makeup. It consisted of the following: after I had prepared her skin with moisturiser and primer, I did the highlight and contouring and blended it all very well, and then I applied the HD airbrush makeup by Kryolan and sealed it with some HD loose powder as well. This makeup technique is excellent for hot weather; it’s water and sweat resistant and a way to secure that the makeup lasts fresh and beautiful for a extended period. I’m in love with Magnolia’s final look. We used her favorite colors and brought out her natural beauty. Their setting at Villa Marcela and wedding decor in blue navy with a touch of light pinks, frames with the ocean as a backdrop was just perfect. We’re happy and honoured to be part of Magnolia and Billy’s wedding day! We wish them lots of love always! - Wedding Planner Cristina Cabrera from Karla Casillas & Co.